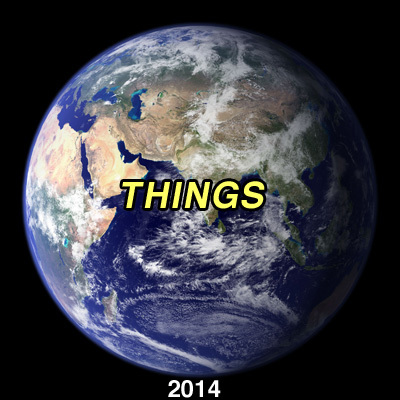 Ever hear the expression “some thing is better than no thing?” Well, 2014 was the year that showed it to be true. There were more things in 2014 than in any previous year, and here’s how to prove it: Try to remember every thing you saw, heard, tasted, experienced, or interacted with in 2014. Can’t do it, can you? “Too many things,” you say? That’s because 2014 set a new record for the amount of things in one year, and that’s why 2014 will forever be known as a “Classic Year For Things” (CYFT). What are things? They are the stuff of life! They make up the universe and all our perceptions. Some things are very small (molecules) while others are bigger than you can imagine (the tallest skyscrapers). But when all those things come together … well, friends, that’s when we get something called a TOTAL THING PARTY. That’s what life is. So take a moment to celebrate things … and enjoy this list!